Your problem becomes our top priority. Call All-n-One Plumbing at (816) 886-7600 for personalized plumbing solutions at the best value. Proudly serving the Kansas City Metro, including Independence, MO. 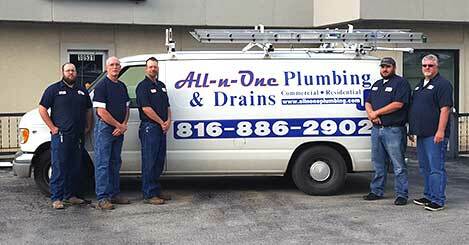 Welcome to All-n-One Plumbing, your trusted plumbers serving Independence, MO and the Kansas City Metro Area. 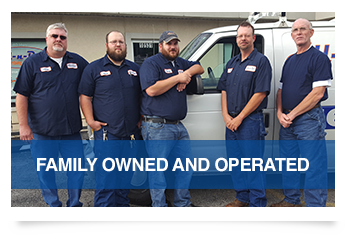 Whether it’s a clogged drain, broken water heater, faulty kitchen plumbing, or anything in between, our team has you covered. 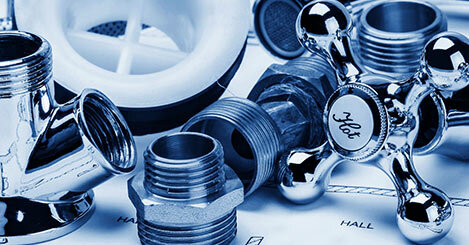 We are a full-service plumbing company specializing in drain and sewer services. 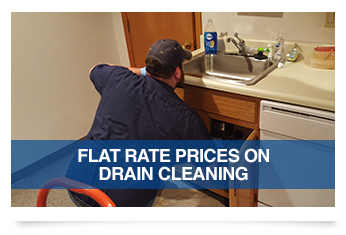 Our team can unblock the most challenging drain clogs and return your plumbing to normal again in no time – all at a reasonable price! We are are committed to delivering top-notch solutions that will leave you with nothing but the peace of mind you deserve. Enjoy the convenience of prompt service, upfront pricing, and quality workmanship on every job. We never cut corners or try to take shortcuts when it comes to your safety and comfort. Expect nothing short of exceptional service with our team by your side. Your safety is our priority. Trust the experts at All-n-One Plumbing – Integrity Above All Else! All-n-One Plumbing started out with one technician running the business out of his home. Over the years we have grown to become a full plumbing team, with a talented full-time staff dedicated to helping our customers have the best experience possible. We are small enough to be able to give every customer the personal attention they deserve, but also have the manpower to quickly dispatch a technician to your door when urgent problems occur. Our goal is to return you to your normal routine as quickly as possible without compromising quality! What sets us apart from other contractors is our focus on delivering outstanding customer service. To us, it’s not just about having the technical skills. In order to provide an all-around excellent experience for our customers, we also need to be personable and flexible when it comes to your needs. We take the time to listen to your concerns and will work closely with you to arrive at the best course of action. You will always know what to expect before any work begins, so there are never any surprises at the end. Expect hassle-free service from start to finish. "They did such a wonderful job at our newly renovated salon in Independence. They did everything from our shampoo bowls to our plumbing in the restroom." "All-In-One's claim of "Integrity above all else" is one that they stick to! The technicians were also extremely knowledgable about the intricacies of old houses and Kansas City's sewage system. We will definitely be taking their advice for future maintenance. Highly recommended!" "I have used All-N-One numerous times to do work at my grandmothers house. They are always prompt, fair, professional and they stand behind their work. 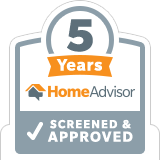 They have earned my business and I'll recommend them to anyone needing services they provide." "The people who did the work were professional, friendly, and just all-around great to use. We'd HIGHLY suggest you take advantage of their services!" As an All-n-One Plumbing customer you have direct access to long-term peace of mind. When you work with us you can expect honest and upfront service, with no detail overlooked. What we quote is what you pay, with no hidden charges or surprises when the job is done. We will not try to sell you a product or service you do not need. You will only be presented with options that fit your specific needs so you can enjoy true peace of mind. Our technicians wear shoe covers and keep the work area neat throughout the job. We will even clean up any messes we make, so it will seem as if we were never there. We will leave your home in the same clean condition that we found it! You can rest assured that your property is in safe hands. Our technicians and office staff are passionate about customer service and are ready to go above and beyond to ensure your satisfaction. Leave all of your plumbing problems to us! All-n-One Plumbing works with your best interests in mind. The job is not done until you are 100% satisfied with the results. We will do everything we can to ensure a smooth and pleasant experience for you. If for any reason you are not completely satisfied with the service provided, we will make every effort to remedy the situation. We won’t call it a day until you have a smile on your face. Don’t let plumbing or drain problems keep you from getting things done. Get right back to your normal routine with professional solutions from All-n-One Plumbing. 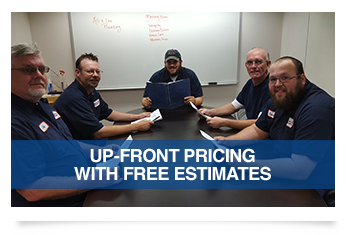 Give us a call today at (816) 886-7600 to discuss your needs and schedule your free estimate.